Paris Shopping Tips: Meet My New Favorite Big Cheese! With the bright sun in my eyes, here’s a full confession. Lean in as I whisper, see. I’ve got a new favorite cheese in my life. Love is in the air. So grab a ball point pen. Hear my yarn! Butter. Brillat. Butter. Brillat. That’s what he said. Thank my cheese monger friend Ishai (extraordinaire! ), for introducing us to this very velvety, voluptuous beauty. I’m a fool for fresh salted butter, so for me it was love at first bite. In fact, I squealed. Read my hips. This decadent triple cream cheese from Rouen contains a whopping 75% butterfat and about 40% fat overall. Yes, this little piggy will be returning to the market for more. Tip! I recommend serving it with a sparkling wine or a palate-cleansing beer. The carbonation will cut the fat, while enhancing its milky mushroom flavor. Sample Brillat Savarin as a fresh young’un. For the love of cream cheese or ice cream, you won’t be sorry. It tastes buddah! Here are a few historical tidbits to help pump up your plateau de fromages and cocktail party conversation. Created in the 1930s by Henri Androuët, he named the cheese after 18th century French gastronomic guru, Jean Anthelme Brillat-Savarin. 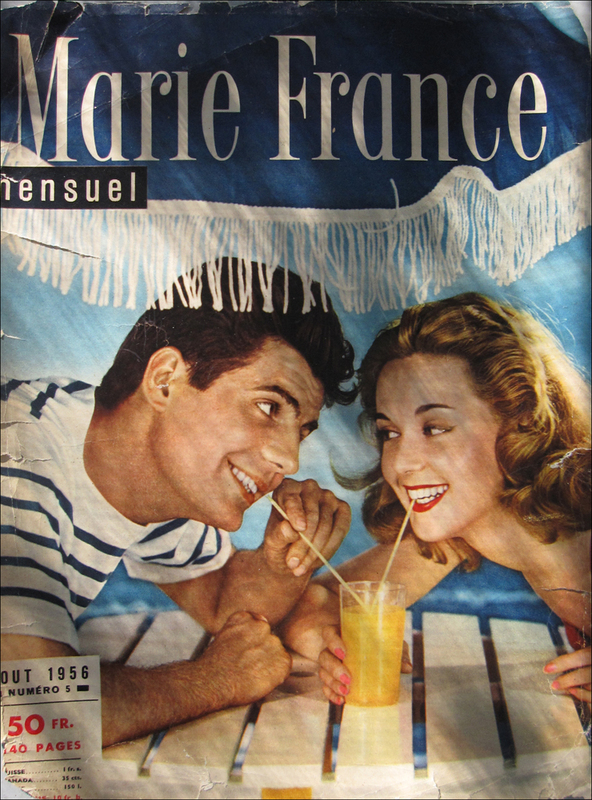 Celebrating photographer Denis Manceaux, I’ve also included a few of his fab Marie France covers from the 1950s. His giddy work never fails to lift my spirits. Pinching from Holly Golightly: If I could find a place to make me feel like the a Manceaux cover, then I’d buy some Ikea furniture and give the cat a name! Here’s another little secret: I often find stacks of vintage magazines like Marie France, Elle, and Marie Claire at the Porte de Vanves Flea Market for just a few euros of pop. Smooth Sailing! Looks and sounds devine…………I can almost smell the richness……and nobody likes a beautiful one-eyed woman…..what??!!? Brillant Savarin it will be ………hope I can find it in the culinary desert of Texas! 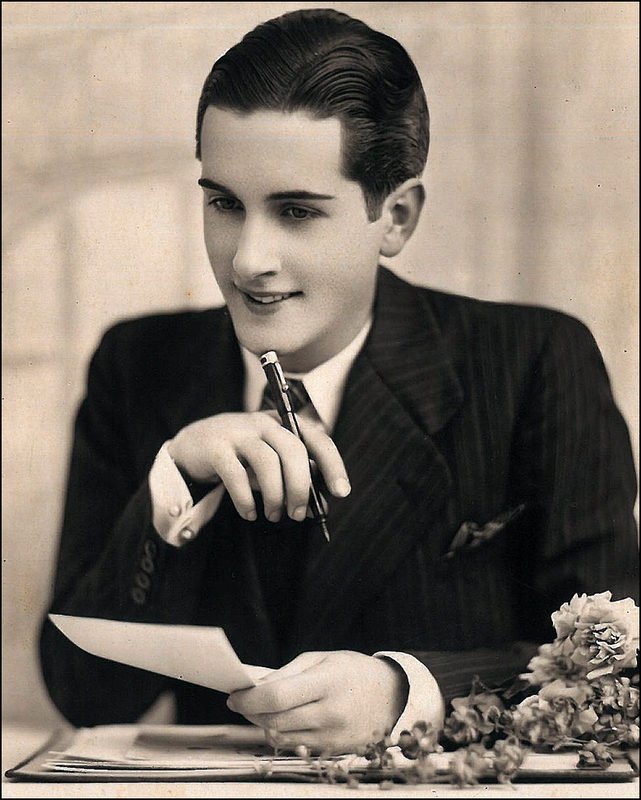 Guess what ……..off to Italy for a week on Saturday! yippee………..wish it was France! Nicely written on two delightful subjects. One can’t find enough topics to describe as ‘giddy’ these days…congrats. Mouth watering, I am also a lover of a good salted butter, we used to spread it on traditional NY style ‘crumb buns’, when my familiy woned a delicatessan years ago. I still find myself doing that. Now I HAVE to go eat something …. Spent many hours shopping in Smithtown before the malls came to LI. That whole area is beautiful but so over populated now. Like billy Joel says in Downeaster Alexa – there ain’t no Island left for Islanders like me – We left in 1999. How did you end up in France? What a dreamy quote!! Thank you! T.
Had I spotted John Waters ………….. I do believe he would have had the sense to caste me in some wonderful show! 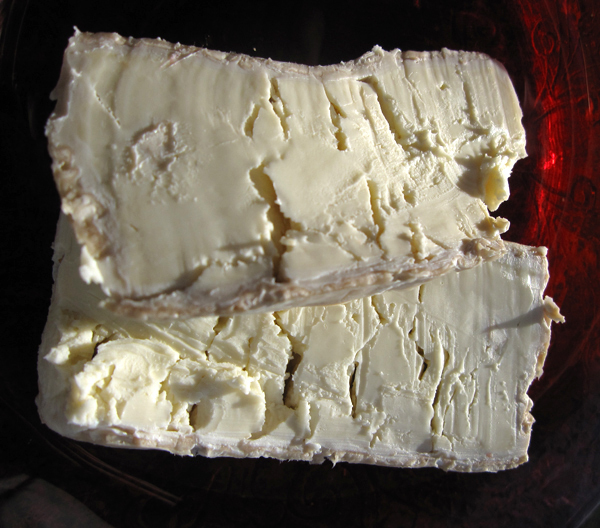 Ah, YUM…to the Brillat Savarin! And the 50s mag covers? Quite informative. I, myself, remember the 50s here in the states quite well…an awful time, except for the coming of Elvis. US fashion was horrendous…June Cleaver cleaning house while wearing a shirt-waist and pearls. We never did get to meet her hairdresser, did we? Merci beaucoup, Theadora, pour la poste! My Greek relatives would say, “Opa!”. Oh my, a friend after my own heart. Love, love, love cheese and will have to seek this one out. Brilliant pics, btw and a refreshing and yummy post today! This looks so wonderful Theadora! There is nothing better than opening my reader to a giant picture of yummy cheese! xo! Oh my giddy aunt! That sounds divine. Love the B-S quotes too- might try to start a clairvoyant career with the tell me what you eat thing. It’s so true! 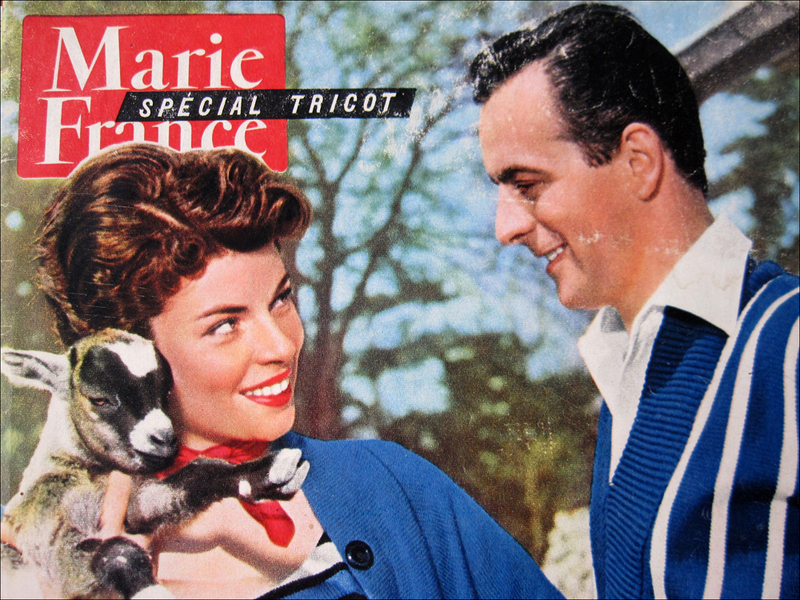 Is the goat in the Marie France cover photo giving us a hint that the cheese is goat? And I am sure I am going to love this triple cream Brillat Savarin!!! OMG, France has the best cheese in the world!!!! I always wanted to visit Rouen too. Oooo…I love cheese. My mouth is watering. So surreal, those old magazines. 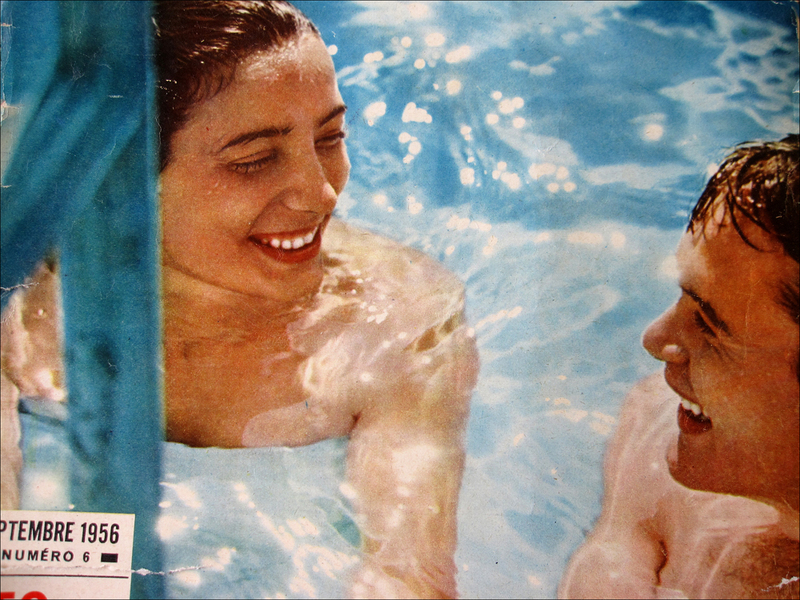 Were things really that happy, that innocent, that brightly colored? Waah! I want to go back! Except not back to 1950s dentistry or untreated city water–the present-day age does have a few good things about it, I guess. Not least is good internet connections with the chance to see things like this. Thank you! I *really* want some cheese now! And, love the photos! Cheese is my passion, seriously, and french cheese is the apotheosis! Love, love, love your blog – keep it coming! Yeah! I get my deposit back! I can buy more plants!